Lookbook held a contest where six winners will be chosen and they get to go to NY, Toronto or Sao Paolo. I knew that my chances of winning was very slim because there were a lot of popular Lookbook users who joined the contest… Anywho, I focused on the DIY part of the contest, so fingers crossed! I basically bought some studs, used the a special kind of sewing tool (have no idea what it is called in English) to loosen the threads of my back pocket and studded half of my backpocket. I must say that I am very pleased with the result and numbing my fingers due to the studs was really worth it! The Levi’s jeans jacket can basically be bought anywhere but the best part is that it is oversized! I detested jeans jackets because the style that they used to sell in stores are the tight kind and I really hated how it made my upperbody looks. If you are looking for an oversized and a looser fit then this jacket is perfect for you! I suggest you immediately buy one! You look SO cool! Love how you rock the denim with the stripes and Converse! I think your DIY is great, you whole outfit is great actually! Btw thanks for your comment! Do you want to follow each other? Wauw wat een super leuke outfit, de all-stars maken het helemaal af! Levi forever:) You look very cute! 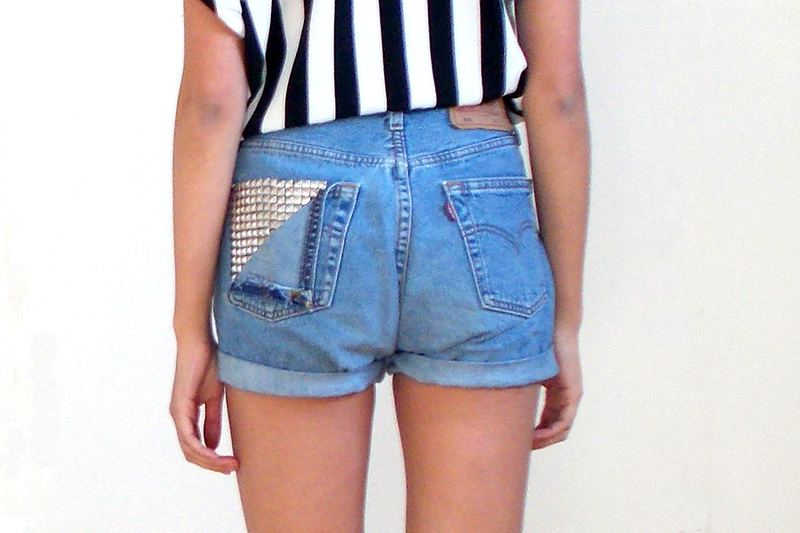 Lindo esse look, rock vintage!